I have been playing Magic the Gathering casually for 15 years. Most of my decks do not follow any rule set and are just good fun, exploring and often exploiting interesting rules. 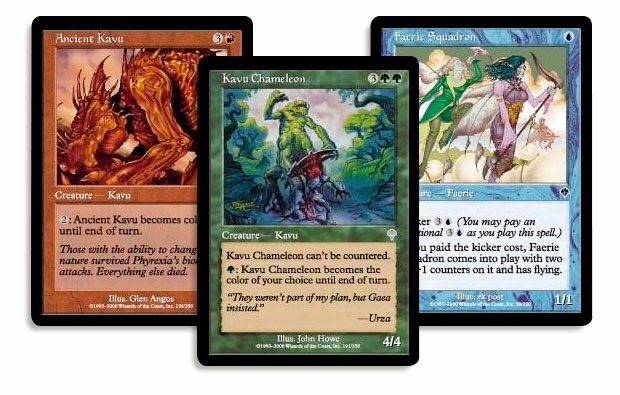 However, 15 years is a really long time, and a year or two ago I finally got bored of simply waiting to see whose broken deck got their mega-combo off first. So I started looking into different ways to play the game, and different ways to limit deck building. After searching through the various types of deck building (and seriously considering playing Commander), I decided to give Block Construction a try. For those of you who do not know, Block Construction is a style of deck building that only uses cards from an expansion block or set. The first block I decided to explore was the Invasion Block. This was partially because it was the was current when I started playing, and because I did some research and discovered that invasion block works well in this format. The Invasion Block has a lot of cards that effected by controlling many different colours of mana. This means that when using a 5 coloured deck, these cards can become incredibly powerful. However since most modern decks don't feature more than 2-3 colours, a lot of invasion cards end up gathering dust in the binder. However, when building Block Constructed Decks, the games are actually balanced enough to use those rules and combos that never made it out of the block. The Trick of course to making Invasion Block decks, is to add as many colours as you can! 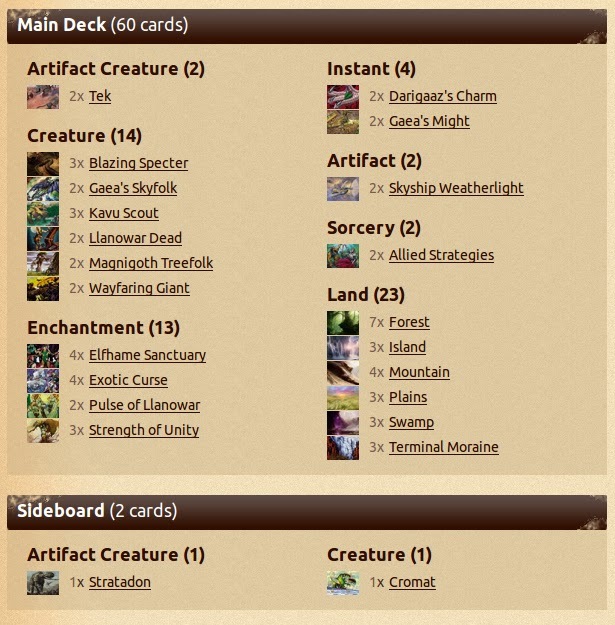 Thank you MTG Vault for deck building tool! Coalition is my five coloured deck, and frankly it is a bit exhibitionist. I am using a lot of the cards that are effected by different colours, just to see how they work, and to show people unfamiliar with the invasion block what it is all about. 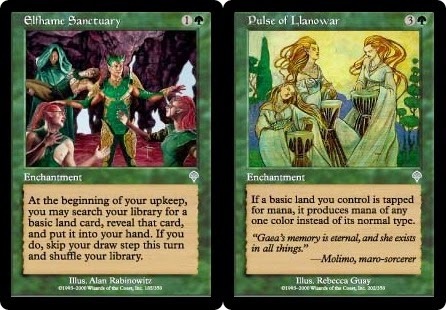 What really makes the five colour combo in Coalition work are Elfhame Sanctuary, and Pulse of the Llanowar. These two cards will let you get the colours of land you need out quickly, and will let you play just about anything of any colour from your hand. From there, it is simply a matter of getting the rest of your land out. Just about any card in this deck gets pumped up by the number of different coloured lands on the board, so just stay the course and build up! 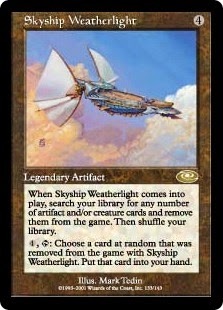 The one precaution I included are the 2 Skyship Weatherlights. This will let you pull some of the larger cards into a pool which you can draw from to guarantee a good card. Nice and simply, using a lot of fun rules and all five colours, it is what the Invasion block is all about! In closing, I highly recommend giving block construction a try! It will let you really explore all the cards within in a block and it creates a unique challenge of creating a deck with such a small card pool to work with. 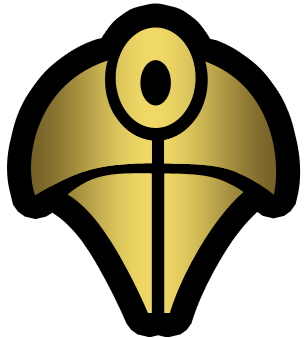 If you are uncertain of which block to start with, I would recommend Invasion. Its strange cards make for some wonderful combos and great game play! But if that doesn't suit you, then pick your first magic block and go from there. P.S. My decks are always a work in progress. So, if you have any suggestions or tips about improving this deck, I would be happy to hear them!